On Tuesday 14th of February, the "I Love Free Software" day was celebrated for its eighth consecutive year, in what can now be called a tradition. This day has become a special day for people all around the world to declare their love and affection not only to their partner but also to the whole Free Software community. The FSFE would like to thank everybody who participated during this year’s #ilovefs campaign. Thank you for taking the time to show your appreciation to the people that make Free Software possible: the developers, designers, testers, translators and projects that work hard every day to preserve our freedoms. And thanks to everybody for your pictures, videos, blogs and news posted during the 14th, before or after. Because of you, the #ilovefs campaign has become an authentic success. The first love signs were shown at FOSDEM in the beginning of February. This year we held again our IloveFS photobooth and many people, (but don't assume only people) posed in front of our camera in order to confess their love for their favourite Free Software projects, colleagues and community contributors (see our full gallery). When we asked them why they love FS, words such as Free Society, Democracy and Freedom were repeatedly written on our black chalkboards. Who said, you cannot love and be wise at the same time? 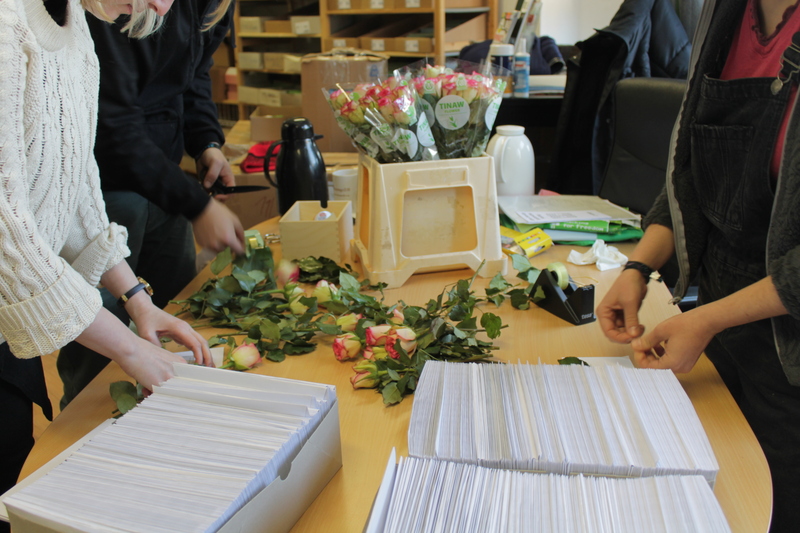 In this ambient full of love, we also distributed around 20 IloveFS packages to Free Software projects present at FOSDEM. Each package included a variety of stickers, leaflets, balloons and a paper with creative ideas in order to grant some inspiration to all those considering to participate in this year's celebrations. The FSFE volunteers, based in Berlin did not stop there! 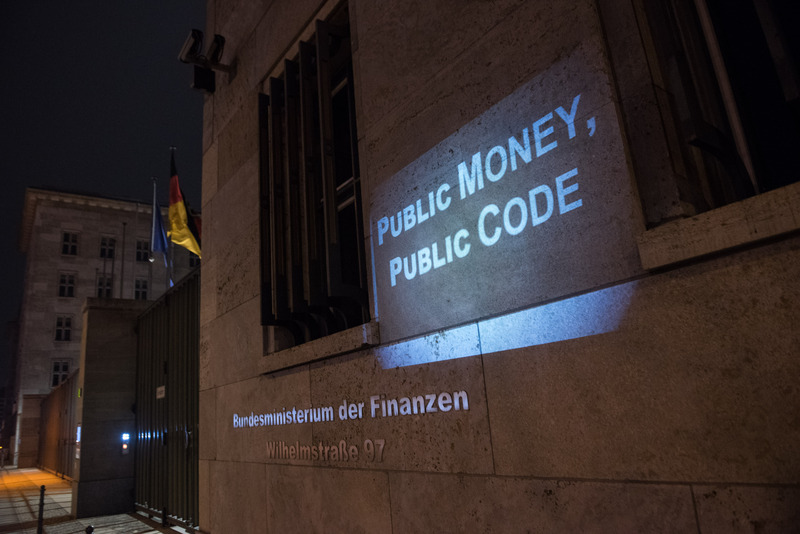 They chose to combine once again political activism with their love for Free Software and spent a night in the streets of Berlin with a light projector and thought-provoking love messages on the German Parliament, the Federal Ministry of Finance, the Berlin Wall and other places of public interest. 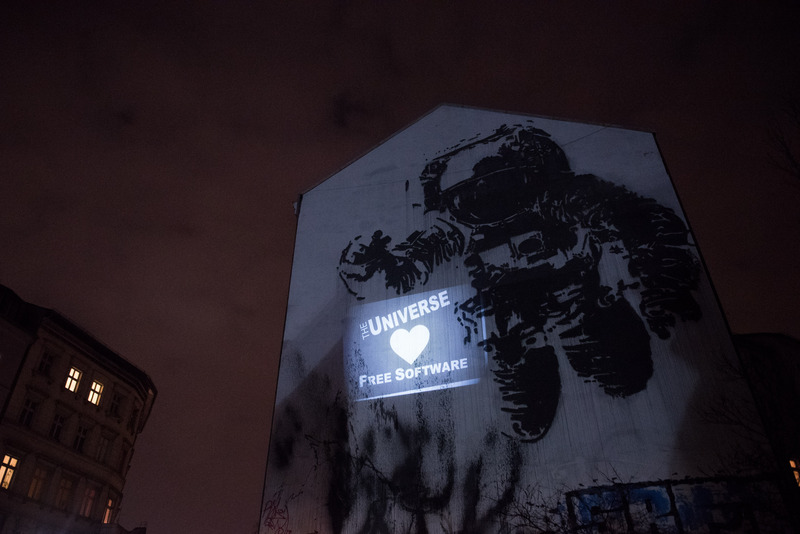 In the end, even the Berlin Astronaut admitted the universe's love for Free Software. 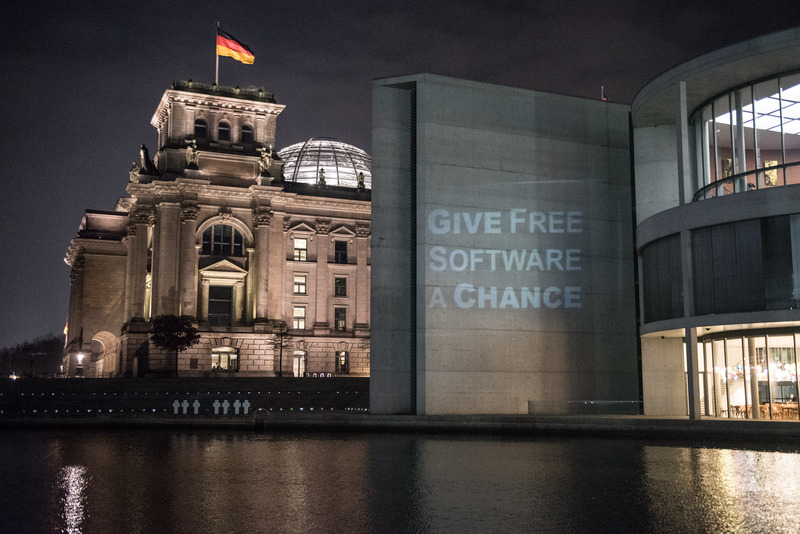 On the very same night of the 14th, some Pirates of Hesse also took part in the beamer action and displayed messages of Free Software affection all around Frankfurt. And finally, the big day has arrived. During Tuesday, 14 February, people all around the world expressed their appreciation to Free Software and the people that make it possible, in many ways, including blog posts, pictures, news items, microblogs and funny memes. Keeping with the cheesy theme, heart-shaped specially decorated chocolates could not be missing from such a day. Also, we were really happy to see that many organisations, coming from different backgrounds and regions, decided to promote the “I love Free Software” campaign from their respective websites. Medialab Prado, in Madrid, organised activities to promote the use of Free Software during the whole day. The artist Elektroll, decided to show his appreciation for Free Software projects with this wonderful artwork. OSB Alliance informed about FSFE's activities and promoted love for Free Software on its page. In general, we would like to thank all the organisations who decided to promote "I Love Free Software" day, like: Ansol, Xarxanet, Punt Tic, Linux Today, Gizlogic and many others. Some Free Software projects took the occasion to send a special ‘thank you’ to their hard working communities, like KDE Spain, The Document Foundation or Framasoft. Julia Reda, Member of European Parliament, did not miss the chance to show her support for Free Software by calling out Munich to stay with LiMux. Also Green MEP, Jan Philipp Albrecht, posted on twitter about his love for Free Software and the FSFE. In their website GrünDigital, the German Greens expressed their political support for the Free Software community. As did the Pirate Party Hesse, calling for the use of Free Software in public administrations. In his blog, FSFE’s president, Matthias Kirschner dedicated his #ilovefs thank you to Free Software contributors in the public administrations. Erik Albers, FSFE's community builder, prepared a blog with nice memes of classic philosophers and their vision on Free Software. While, Max Mehl, our Germany Coordinator, blogged about his new favourite email client, astroid. We hope all Free Software contributors out there feel even more motivated after this year's #ilovefs day. Our own conclusion? "Build Free Software - Not walls", because in the Free Software world, different languages do not divide us. Instead, our love for freedom unites us all. We encourage everybody to mark next year's February 14 as "I Love Free Software" day to continue this lovely campaign. Nevertheless, don't forget: each and every day is the perfect day to show your appreciation to Free Software and its contributors, by using, studying, sharing and improving it.